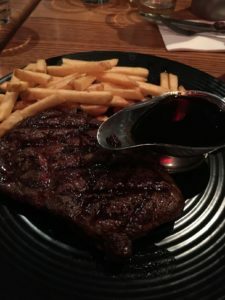 Had dinner last week at TGI Fridays Melbourne Central, which is an American themed chain restaurant, I think I’ve been to one before quite a while back but don’t remember what I had. Anyway, we were there for a friend’s birthday, it was probably a good thing we didn’t mention it to any of the staff as they have a strange custom of a embarrassing birthday celebrations by announcing it to the whole restaurant and then singing and screaming some song. It took us a while to decide and even longer to order (pretty busy on a Saturday night), but Emmy went with the Scotch Fillet, and persuaded me to get the ribs (I probably would have just gone with a burger otherwise) because most reviews online say to get the ribs (Jack Daniels glaze). The wait for food wasn’t too long for a busy night, can’t remember how long, but it didn’t seem too bad, even though it was late and we were hungry. Emmy ordered the steak medium (because she isn’t supposed to eat the juice) and to everyone’s surprise it was actually, probably medium, even a little juicy (red) in parts, so it was actually cooked pretty well, it came with a side of the Jack Daniels glaze sauce. It doesn’t come with salad but does come with chips which I didn’t rate very much. But, the steak was cooked well, nice and tender, so thumbs up for that. My ribs, at 42$ are a bit over priced I think, they’re not as big as the ones I had at the grill place in Queenstown, come with a side of chips and coleslaw (lol), I’m not sure if I’d call the coleslaw a side, it was like a thimble size. As far as ribs go they were good, but to be honest, ribs don’t really do it for me, it’s just meat with a glaze on the bone. There’s a good amount of meat but overall, the flavour is not enough to justify the billing. 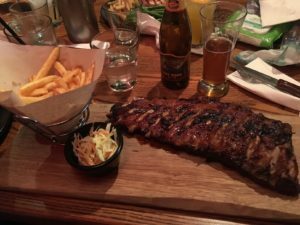 Ribs as a shared dish makes more sense to me, as a main it doesn’t have enough by itself. I’d stick with steak or a burger if I ever went back. 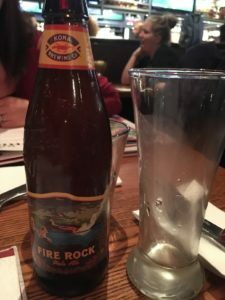 I had a Kona Fire Rock Pale Ale to keep my thirst quenched, it was not bad, I’m enjoying these craft beers more and more lately. They didn’t have any darker beers so I just went with a pale ale which was pretty good. I don’t think I would ever take Emmy to TGI Fridays by ourselves, maybe they only really shine on an actual Friday?